by the team behind the Despicable Me movies. Keep watching to the end for a bonus Grinch easter egg! versions is that the filmmakers have deliberately made him a little more likeable and relatable. festive film, so they sanded down his spiky edges somewhat. In the original book and made-for-TV animation, the Grinch didn't have any real backstory. him and open up a path for him to heal over the course of the story. But what about the new Grinch's appearance? eyes of the 60s animation and the green on yellow eyes of the live-action. which I imagine was done to make him look more generally appealing. in his fur feels like a nod to the character's drawings in the book. audience including people who'd never seen the original Dr Seuss and Chuck Jones artwork. The Grinch's dog Max has been part of his story since the original book. But in this new version, the relationship between Max and the Grinch is much more developed. best friend, his pretty much constant companion, and his devoted right-hand dog. taking her family's Christmas tree. him to help out her tired, over-worked mother. There's also a whole host of new characters introduced in this film. us see a different side to the green Christmas thief. adds to the film's comedy! Another new face in Whoville is the Grinch's nearest neighbour, Mr Bricklebaum. the Grinch, of course, has an entirely different view of the situation! of Santa and Snowman inflatables to celebrate the holidays. Also not in the original book or TV special is the Mayor of Whoville. film and he was an entirely nasty piece of work. In fact, he was the reason why the Grinch cut himself off from society. character, and it's a real treat to hear her played by Angela Lansbury. mother competes to have the best Christmas lights in Whoville. is about much more than things. who are all new additions to the popular story. Axl, and the wisecracking Ozzy. of colourful Who homes more or less triples in the TV special, it's still a tiny town. as the Whos were more materialistic. stores, businesses, and vehicles reflect the warm and welcoming nature of the Whos. The new Whoville is a vibrant town full of vivid colours. possible to keep a similar vibe to Dr Seuss's work. 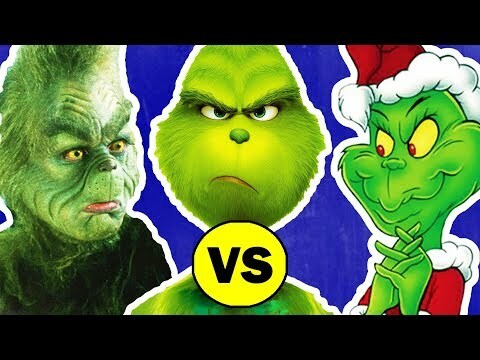 Story-wise, there are some interesting differences between all the versions of the Grinch's tale. carry out his plan to steal Christmas. to steal their big day. he returned as holiday Cheer-Meister for the Who's seasonal celebration. way through all the food in his house ahead of Christmas. to stop the noisy madness of it all! plan to rob the Whos turns out to be much more challenging than previous adaptations. In fact, this time, it's a whole big production, more akin to a huge heist! Oh, and the Grinch's cave is also full of ridiculous, hi-tech gadgets and gizmos too. 'You're A Mean One, Mr Grinch', which is given a totally different spin. There's also a new song, 'I Am The Grinch', which plays over the closing credits. Karloff lend his inimitable voice to the TV special. the style and spirit of the original. for the Despicable Me movies. Now, which is your favourite version of the Grinch? And what do you like best about the new movie? for another video you're sure to like. If you enjoyed this, I really appreciate a thumbs-up and a share! Thanks for watching and see ya next time. Ppl don't know who they're voting for nor what that will mean to so many concerned with parental rights to choose what's best for their kids. If you follow the herd blindly you could easily be led to slaughter, imho. :/ Think about it; or just think for yourself for a change. From Chelsea Clinton's wedding to Matt Damon's vow renewals, he's seen it all. How do the world's best spies use disguises to blend in? We sat down with Former Chief of Disguise for the CIA Jonna Mendez to explain. The Agenda examines how Canada can best protect its cultural industries and compensate creators as the Trudeau government reviews the country's digital copyright rules. Then, discussing the origins, evolution, and ongoing importance of Myers-Briggs, the world's most used personality test. Happy birthday to the greatest old man in rock. Beyond hawking hardware and software, the monetization of identity defines the ultimate tech business model. Celebrities offer their thanks, remembrances and condolences after the death of Marvel legend Stan Lee.